France is a leading country in the fashion design industry, along with Italy, Germany, the United Kingdom, Japan and the United States. Fashion is an important part of the country's cultural life and society, and the French are well known for their good taste in fashion. Haute couture and the prêt-à-porter, among other fashion styles, remain part of French traditional life. France has many famous designers. French design became prominent during the 15th century through today. 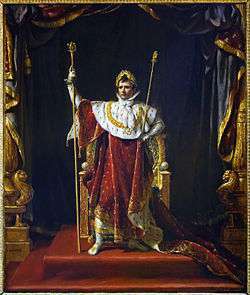 The fashion industry has been an important cultural export of France since the 17th century and the modern haute couture where originated in the 1860s. Paris acts as the center of the country's fashion industry. Along with New York City, London and Milan, it is considered a leading fashion capital. Paris is home to many premier fashion designers including Chanel, Pierre Cardin, Céline, Chloe, Dior, Givenchy, Jean Paul Gaultier, Hermès, Lanvin, Rochas, Vuitton, and Yves Saint Laurent. 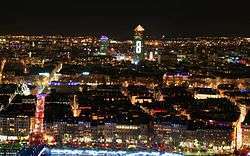 Many French cities, including Lyon, Marseille, Toulouse, Lille, Strasbourg, Bordeaux, Nantes and Rennes, host important luxury districts and avenues. In recent centuries, these cities have transformed into developed cities and are heavy producers and costumers of luxury goods. Île-de-France, Manosque, La Gacilly (near Rennes), and Vichy lead the cosmetic industry, basing well-known international beauty houses such as L'Oreal, Lancôme, Guerlain, Clarins, Yves Rocher, L'Occitane, Vichy, etc. The cities of Nice, Cannes, St. Tropez,are among others of the French riviera, are well known as places of luxury, annually hosting many international media celebrities and personalities, potentates, and billionaires. 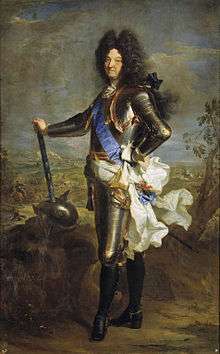 The association of France with fashion and style (la mode) is widely credited as beginning during the reign of Louis XIV  when the luxury goods industries in France came increasingly under royal control and the French royal court became, arguably, the arbiter of taste and style in Europe. 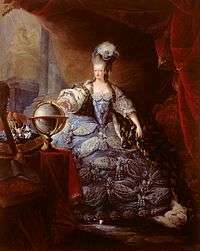 The rise in prominence of French fashion was linked to the creation of the fashion press in the early 1670s (due in large part to Jean Donneau de Visé), which transformed the fashion industry by marketing designs to a broad public outside the French court and by popularizing notions such as the fashion "season" and changing styles. 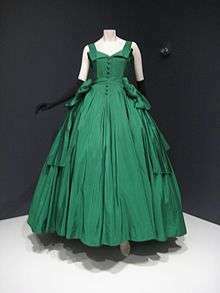 France renewed its dominance of the high fashion (French: couture or haute couture) industry in the years 1860–1960 through the establishing of the great couturier houses, the fashion press (Vogue was founded in 1892 in USA, and 1920 in France) and fashion shows. The first modern Parisian couturier house is generally considered the work of the Englishman Charles Frederick Worth, who dominated the industry from 1858–1895. In the late nineteenth and early twentieth century, the industry expanded through such Parisian fashion houses as the house of Jacques Doucet (founded in 1871), Rouff (founded 1884), Jeanne Paquin (founded in 1891), the Callot Soeurs (founded 1895 and operated by four sisters), Paul Poiret (founded in 1903), Louise Chéruit (founded 1906), Madeleine Vionnet (founded in 1912), Elsa Schiaparelli (founded in 1927) or Balenciaga (founded by the Spaniard Cristóbal Balenciaga in 1937). Chanel founded by Coco Chanel, it first came to prominence in 1925, its philosophy was to emphasize understated elegance through her clothing. Her popularity thrived in the 1920s, because of innovative designs. Chanel's own look itself was as different and new as her creations. Instead of the usual pale-skinned, long-haired and full-bodied women preferred at the time, Chanel had a boyish figure, short cropped hair, and tanned skin. She had a distinct type of beauty that the world came to embrace. Yves Saint Laurent, was a Pied-Noir French fashion designer, and is regarded as one of the greatest names in fashion history. Since the 1960s, France's fashion industry has come under increasing competition from London, New York, Milan and Tokyo. 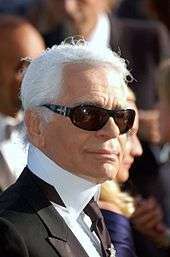 Nevertheless, many foreign designers still seek to make their careers in France: Karl Lagerfeld (German) at Chanel, John Galliano (British) at Dior, Paulo Melim Andersson (Swedish) at Chloe, Stefano Pilati (Italian) at Yves Saint Laurent, Marc Jacobs (American) at Louis Vuitton, and Kenzo Takada (Japanese) and Alexander McQueen (English) at Givenchy (until 2001). The Avenue des Champs-Élysées is the avenue of luxury and beauty of France and is the location of many headquarters of upscale fashion, jewelry and beauty houses. It is often compared with the 5th Avenue of NYC and the Avenue Montaigne, an adjacent avenue that is also known for its prestigious fashion headquarters since the 1980s. The fashion houses have been traditionally situated since the 17th century in the quarter around the Rue du Faubourg Saint-Honoré. Other areas, such as Le Marais, a traditional Jewish quarter, have also included the clothing industry. The city's numerous fashion districts consolidate it as a fashion capital. Lyon, the second largest city of France, is a growing fashion industry center. It has been the world's silk capital since the 17th century, with an important textile industry and a strong fashion culture. It is the second biggest luxury goods consumer of the country, with major streets and districts holding houses of high fashion. Marseille, the third largest city of France, and the principal port of the country and of the Mediterranean, and second of all Europe. The city is affectionately called "The Old Lady of the Mediterranean" or "The City of Contrasts". The city has enjoyed its position on the continent being a fluvial port with ships full of fashion products. The avenue Canebière is called the "Champs Elysées of Marseille". Rue Paradis and the Rue Grignan are known for being the avenues of luxury in the city, holding high fashion boutiques such as Louis Vuitton, Hermès, YSL, Chopard, Kenzo, Tara Jarmon, Gérard Darel and many others. The Rue de la Tour is called La Rue de la Mode ("The Fashion Street"), where the newest Marsellaises fashion designers and artisans are supported by the city government, for creating and growing the fashion industry in the city. Some of the famous fashion houses here are Diable Noir and Casa Blanca. ↑ "Marie Antoinette Biography". Chevroncars.com. Retrieved 17 July 2011. ↑ "Reticule". Austentation: Regency Accessories. Retrieved 4 November 2012. ↑ Vaughan 2011, pp. 47, 79. 1 2 Caroline Weber, "Fashion", in Dauncey (2003), pp. 193–95. 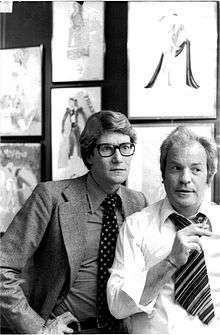 ↑ "Yves Saint Laurent, Who Has Died Aged 71, was, with Coco Chanel, regarded as the Greatest Figure in French Fashion in the 20th Century, and could Be Said to have Created the Modern Woman's Wardrobe". The Daily Telegraph. UK. 1 June 2008. Retrieved 24 July 2010. ↑ "Yves Saint-Laurent". Goodreads. Retrieved 20 May 2012. ↑ Yves Saint Laurent's body put to rest Fashion Television.